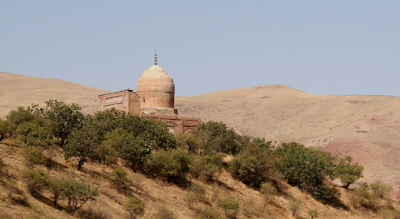 What a marvellous surprise to discover Katta Langar's 15th century mosque and mausoleum in the Shakhrisabz region. I have visited Shakhrisabz many times as a day trip from Samarkand to view the city's World Heritage monuments. However, I was unfamiliar with the surrounding area. Roaming around there this autumn revealed how important it is to keep exploring Uzbekistan, especially the countryside. 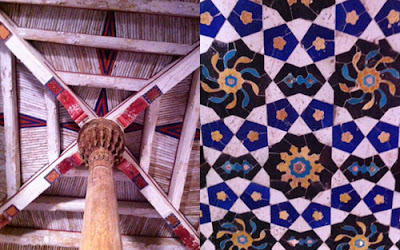 Both these buildings are masterpieces of 15th century Islamic architecture. During the last quarter of the 15th century there was rivalry among diverse Sufi groups: the Naqshbandi order prevailed, and the Ishqiya group retreated to the secluded Katta Langar valley. The mosque and mausoleum were commissioned soon after the group's arrival. The mausoleum houses the tomb of the powerful, local sheik Mohammed Sadik, who died in 1545, and two family members. An unknown noble, thought to be Timur's seven year old daughter, is buried there and a Yemeni sheik who, according to locals, saw the mausoleum in a dream and travelled to Katta Langar, where he died. The interior walls are unusually and beautifully patterned in brown, white and black. (Regrettably, photography is not permitted). The surrounding cemetery is 80 hectares: most of the tombstones are written still in Arabic and the longevity of its inhabitants astonishing. A recently deceased woman was 106, and many villagers lived well into their nineties: testimony to hard work and holy practices. The mosque was built in 1520 and restored in 1870. The plain exterior provides no hint of the dazzling mosaics and finely carved wooden columns and details. Wandering around the mud brick village, little seems to have changed. 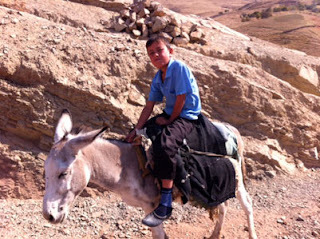 Children ride donkeys, women prepare meals in the courtyards and the men tend domestic animals. Interestingly, many village folk speak some French and the local French school teacher runs a basic guesthouse. I had a tasty lunch there sitting on a tapchan (a raised platform used in Central Asia for relaxing and reclining outdoors) and enjoying the warm, autumn afternoon. My guide for the day was Lutfullo Asamov, whose family runs a simple B & B in Shakhrisabz, about 45 kms from Kattar Langar. Lutfullo and his father are both mountain guides and know the area like the back of their hands. You can contact him on email lutfiy71@bk.ru if you would like him to arrange a trip out to this beautiful village. Why not consider a rural home stay after your Uzbek Journeys tour?